16th October 2008. In this Issue: 250K Topo Maps Australia-Wide, Best Place Update, and Two New Treks - Arthur River to Corinna and Sarah Anne Rocks Track. Travellers should note that due to a massive bushfire earlier in the year some sections of the above treks are currently closed but these should be open again by summer. Information for who to contact is listed within the Trek Notes. If you're keen to get more Tasmanian Trek Notes, keep any eye on the "New & Updated This Week" box on our Home Page for more links to new trek notes as we are currently putting the finishing touches to the Climes Track and the Bay of Fires, Humbung National Park, and Mt William National Park. 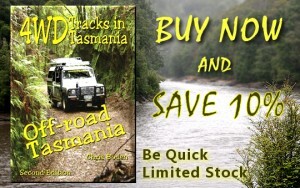 To compliment our Tassie focus, we have a special discount on the tassie 4wd bible - 4WD Tracks in Tasmania by Chris Boden. 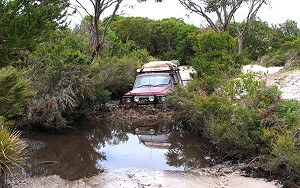 No self-drive traveller to Tasmania should be without it. 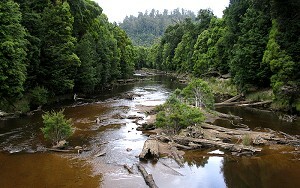 We also have the Explore Australia "Holidays in Tasmania" travel guide on Super Special. New to the Shop this week you'll find over 500 Geoscience Australia Topo 250K paper sheet maps. The easiest way to find which one you'll need for a particular area is to look up the relevant Trek Note orPlace and go to the Recommended Reading section at the bottom of the page. These paper-based maps are only $10 each, however due to the huge range we don't hold them all in stock so when ordering there is a delivery lead time of 2 weeks. For the complete list of over 500 of these maps in our shop, click: Topo 250K Maps. How do people find ExplorOz.com? Have you ever wondered how other people find us? In a recent review of our stats, we noticed that a massive 77.03% of all visitors to our site come directly without referral from links or search engines. This clearly shows that most visitors intentionally visit ExplorOz and have either bookmarked it, or just know the url. As we own many domain name variations of the spelling of the brand name (ExplorOz, ExploreOz) all attempts will redirect to the site. And from the 18.78% that do use a search engine 4 of the top 5 search terms have also been variations of the spelling of ExplorOz - even further reinforcing that our visitors make purposeful visits. In fact, the average visitor views more than 21 pages per visit! So all those anonymous users are very much an important part of our audience. Isn't that great news!